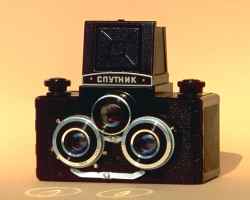 The Lomo Sputnik is a russian-made stereoscopic camera. The Sputnik has not much to be proud about : it is ugly, its lenses are poor, its ergonomics horrible, its shutters laughable and its viewfinder ridiculous. But it makes real, stereo 3D pictures ! Made of bakelite, it is actually two siamese Lubitels with a 7 cm space between the lenses corresponding to the average space between one's eyes. It makes slides couples. By placing a slide in front of each eye, one can recreate a perfect 3D feeling. The lenses are 75mm f/4.5 T22 coated triplets. It uses 120 rollfilm allowing to take 8 6 x 6 cm couples of slides. The results are amazing. Made in USSR, of course. The use of the Lomo Sputnik is quite straightforward. Adjust the aperture and speed on the shutter according to a handheld light meter, focus, and shoot. Focusing can be a bit tricky as the magnification lens magnifies a ground glass so dim that it is of no help. It is better to use an external rangefinder. Framing is quite hard too as the viewfinder is very poor. Try to use the metal frame viewfinder embedded in the hood instead. Don't forget to advance film as there is no fool-proofing against double exposure. Advance the film two frames at a time, as the Sputnik takes couples of pictures.